And oh boy, do you. Literally. I love ComicCon. This shouldn’t be much of a surprise to all of you who read my previous post about Forbidden Planet. ComicCon is the amalgamation of nerd culture at its finest, and it’s simply amazing how accepting everyone is with it. Put a lot of effort into dressing up? Awesome, dude! Not wearing a professional costume? That’s cool too! You’re a fully-bearded man dressed up as an anime girl in a bright pink minidress and a light-up chainsaw? The world is your oyster, my friend. No matter what it is, at MCM, you’ll rock it. I am a huge supporter of cosplay. It’s fun to make and it’s fun to do. This year, I went as Sera from Dragon Age: Inquisition, and I put in about three weeks’ worth of on and off-work to make my bow and quiver, as well as my tunic. There has never been a time where I thought my sewing skills would come in handy** but for once, in costume as a character who dresses tattily and cuts her own hair, it was a blessing rather than a curse. Last year, my sewing abilities did me no favours when I dressed up as Rose Quartz from Steven Universe, but the huge wig that gave me a bit of a headache after an hour probably distracted everyone quite well. Even then, literally nobody at MCM bats an eyelid, because at least a third of the people there are in costume. Everyone is so busy looking at everything there is to offer that there’s simply no time to be haughty anyway, because not only is MCM welcoming, but it is HUGE. Whether you go through Comic Village or simply browse the trinkets in Pop Asia, there is something you will want. My friend, dressed as Link from The Legend of Zelda, has a tradition of buying a lucky cat there every year. I myself, as you may remember, am quite easily swayed by Funko Pops. I bought three – Garnet, Amethyst and Sailor Mercury – finishing up my Steven Universe collection and launching my Sailor Moon one. There is also plenty of food inside, but be prepared to spend money – unfortunately nothing at Comic Con is cheap! I myself had some karaage (fried chicken balls) and a melon soda, and sat eating it on the floor as I watched cosplayers that went by, an island of peace in a day that otherwise never stopped moving. There will always be more things you want to buy. Usually, I will buy some form of comic, but this time around I had to give it a miss. That being said, when your oldest friend works for a big UK comic publisher (Sweatdrop Studios – check them out) she does give me some books for free, so I am usually set on that front. It is one of the only times I ever get to see her any more, though it was hilarious watching her huddled behind her stall wrapped in blankets because she sat directly below the aircon. Just one of the little personal reasons I love MCM, I suppose. 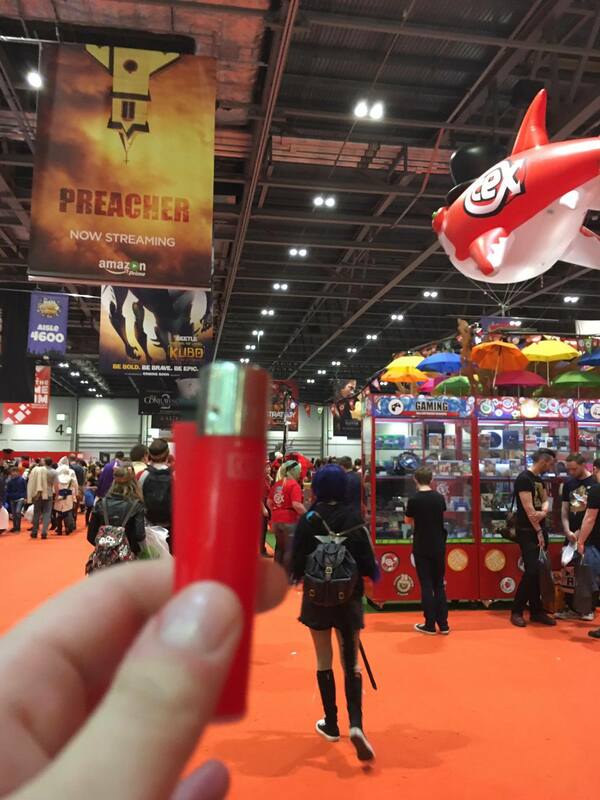 Last of all, a lighter as red as my tunic, and no doubt as red as my face, after so many hours of what was basically non-stop walking – hence why my photo is a bit blurry. I was very much starting to shake from tiredness by the end of it all, though – despite how exhausted I am for the days following ComicCon – it’s always somewhere that I look forward to coming back to. Also, when people stop you and compliment your costume and ask to take your picture, that doesn’t hurt either. *Sadly I did not get a picture of this cosplayer, but he really… TRUMPED THE COMPETITION. HAHAHA. ** I have friends who can do wonders with fabric. They can sew their own dresses from scratch, making designs straight out of their heads. I am lucky if I can keep two pieces of felt together.